Young stars Raj Tarun and Hebah Patel-starrer romantic drama, Andhagaadu, was supposed to hit the screens on May 26. 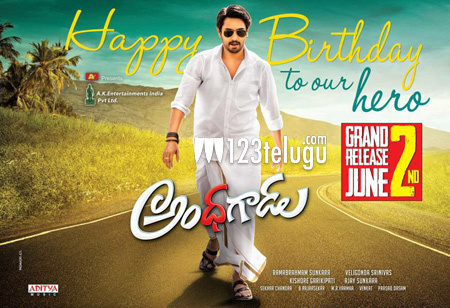 However, the film’s unit, on the occasion of Raj Tarun’s birthday today, unveiled a new poster and announced that Andhagaadu will be released on June 2nd. In Andhagaadu, Raj Tarun will be seen in the role of a visual challenged ​young man. The film marks the directorial debut of noted story writer Veligonda Srinivas. Anil Sunkara, who is producing the movie, is highly confident about the film’s success.